Black Bear Diner is a fast growing family dining concept with 62 restaurants spread across eight western states. Black Bear Diner approached Bouchard Communications Group because they wanted to start generating publicity in the restaurant trade publications. They saw that as an opportunity raise awareness of the brand and raise awareness among potential franchisees with restaurant experience. Their initial request to handle their publicity consisted of “sending out press releases.” Bouchard Communications sat down with them to discuss their PR goals and objectives, and proceeded to create a media relations engagement plan that included desk side briefings, editorial calendar opportunity mining, and story development. 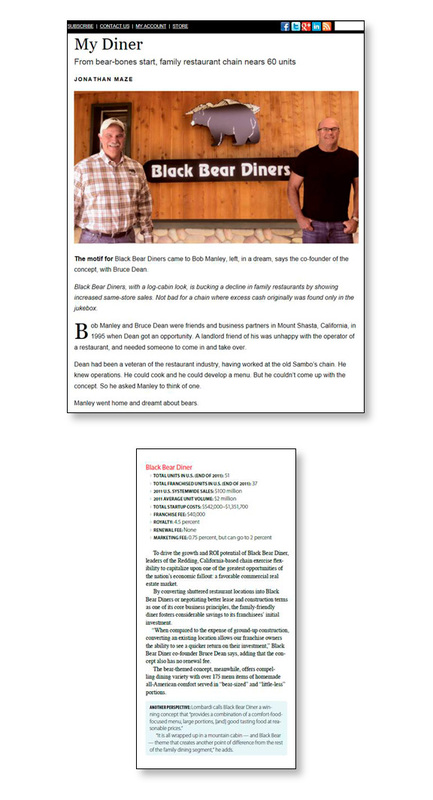 Since working with Black Bear Diner in 2013, we have managed to generate feature coverage in each of the major restaurant trade publications.The coverage in the trade publications was instrumental in securing an interview and mention in the Wall Street Journal.